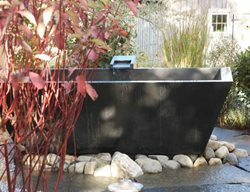 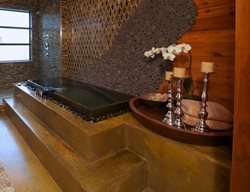 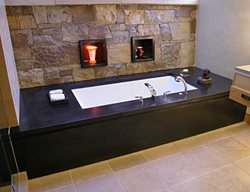 Featured on a recent DIY network TV show, this outdoor tub has heated walls with a new patent (pending) radiant system. 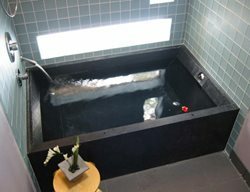 Both the tub and water are heated by a solar system installed on the roof of the home. 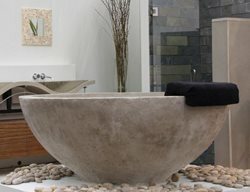 This European style open bath design has stained patina concrete overlay walls, a concrete floor, tub surround, and concrete vanity counters, creating a one of a kind showpiece for the homeowner. 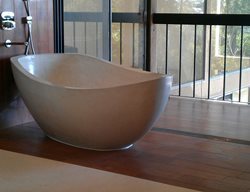 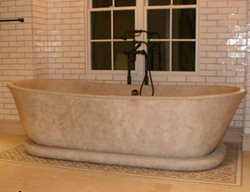 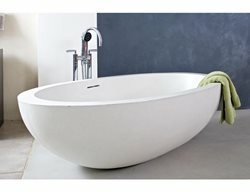 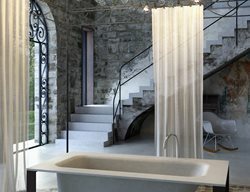 This monolithic soaking tub (72 x 36 x 24; 1500 lb) provides ample room for two in Pourfolio's custom "Mortar" color. 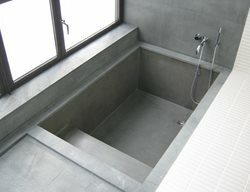 It is designed with an overflow that continues into the plumbing wall to the left of the tub. 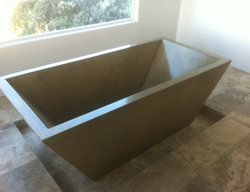 Adjacent to the wall there is a 16 x 16 ramp sink with infinity edge detail. 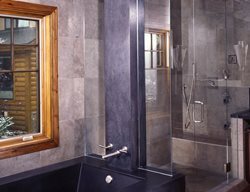 The sink appears to float off the wood wall behind which conceals both the bracketing as well as the plumbing. 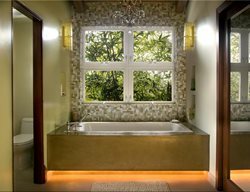 This master bathroom is part of a concrete home originally built back in 1923 by the famed Austrian architect, Rudolph M. Schindler.